Ethereal light at Xi Yuan. Xi Yuan (西园, West Garden) is not, as you might think, another of Suzhou’s classical gardens. It is a Buddhist monastery. Unlike Hanshan Temple, however, which is almost constantly thronged with visitors, Xi Yuan attracts few tourists. Most people who visit Xi Yuan are Buddhists and are there for religious reasons. By comparison with the splendor of Hanshan, you might even call Xi Yuan a bit shabby. The lack of glitz, however, is redeemed by peace and quiet, tranquil beauty, and a strong sense of the contemplative life. It is also home (I think) to the last remaining mating pair of Yangtze River giant softshell turtles (Rafetus swinhoei) and to what is perhaps the most pleasant teahouse in all of Suzhou. On the north side of Feng Qiao Road, just west of Tong Jing Bei Road, the temple is reached by crossing one of two bridges that span the canal running parallel to the road. One is the “Bridge of Wisdom” and the other is the “Bridge of Fortune,” so you really can’t go wrong with either one. Once you are inside, navigation is easy, as the temple grounds are not too large and the choice of routes is limited. Explore the first, large courtyard and the shrine at your leisure, and then continue walking north and exit the shrine through the rear door. You will find yourself in a small courtyard with a path leading left through an arched opening in a whitewashed wall. Follow it into another, larger area featuring the eastern end of the pond. Make your way westward and before long you will find yourself in the main garden area of the temple. At your right is an elevated peninsula surrounded by water on three sides, with tables and benches where you can sit under the trees to snack, chat, rest, and enjoy the peace and quiet. To the left is the teahouse. In front of it a zig-zag bridge leads to a small shrine in the middle of the main section of the pond, and on the other side of the shrine the bridge continues to the opposite shore, where you will see two large statues of the incredibly long-lived giant turtles that—I think—still inhabit the pond. When I first visited Xi Yuan, in 2006 I believe, I saw one of the giant turtles. He (she?) was beached on a small island that no longer exists, and was surrounded by twenty or thirty smaller, common turtles. Since then I have never seen a turtle of any size there. News reports, most of them out of date, indicate that the turtles were taken in hand by the Suzhou Zoo in 2007, but whether they still live at Xi Yuan is unclear. In May 2015 the New York Times reported that new attempts were being made to produce offspring by artificial insemination. The ugly blue plastic aerators in the pond were installed sometime after that, which perhaps reflects an effort by scientists to provide the best possible environment for the turtles. At any rate, the turtles may or may not be lurking under the water, and you may see one or both of them—but it isn’t likely. Still, being that close to such creatures, in whose hands (or reproductive organs) lie the fate of their species, is impressive and sobering, even if you can’t see them. Their invisibility may actually add to one’s somber reflections on our failures, as a species, to care for other, less powerful species that share the planet with us. East of the pond is perhaps my favorite spot at Xi Yuan. 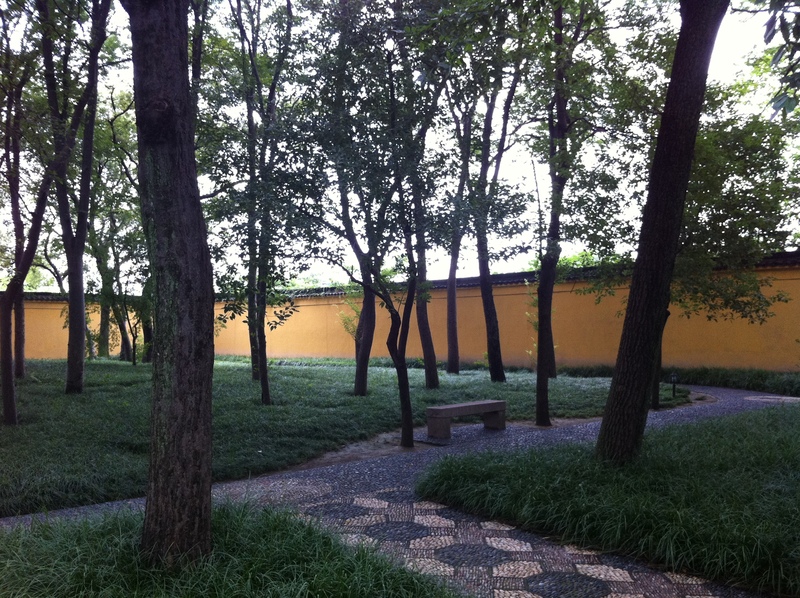 It is a large open area surrounded by the yellow boundary walls of the monastery and dotted with thin-trunked trees whose leaves provide a canopy that filters the light. Underneath the trees is a vast sea of broad-leaved grass, yan jie cao (沿阶草, Ophiopogon bodinieri), whose flat leaves fall over like the hair of a woman who has just showered and is combing out her hair. This plant is often used to border pathways, but planted in masses as it is here, the leaves seem to wave as if underwater. The light filtering through the trees and reflecting from the walls combines with the undulating leaves of the grass to produce an otherworldly effect. It isn’t difficult to imagine achieving some sort of spiritual elevation in a place like this. Find a spot on one of the benches and just sit quietly, drinking in the light. When you have had your fill of light, you may be thirsty. Xi Yuan’s teahouse attracts first with its atmosphere: comfortable furniture, dim lighting, and soothing Buddhist music. You can order from a short list of delicious teas, which are served with nuts and crackers. Adding to these pleasures is a central table where people of all ages sit and copy Buddhist sutras, using calligraphy brushes, black ink, and rice paper. The pious concentration of the calligraphers, joined with the quiet ceremony of tea-drinking and the meditative Buddhist music, creates a sense of calm and satisfaction far removed from the stresses and hurry of everyday life. Relax. Sip your tea. Enjoy. Stunning view through a window at Liu Yuan. From Xi Yuan to Liu Yuan is about a five-minute walk. You can shorten it a bit by leaving Xi Yuan through the side gate: once you have returned to the first courtyard, look left (east). If the side gate is locked for some reason, exit where you came in, cross either the “Bridge of Wisdom” or the “Bridge of Fortune,” then turn left (east) to the intersection and left again to walk north on Tong Jing Bei Lu. The next street leading to the right (east) is Liu Yuan Road. (If you exit Xi Yuan by the side gate, you basically just have to cross the street to find Liu Yuan Road.) From there it’s another 200 meters or so walking east on Liu Yuan Road until you reach the entrance of the garden. Although its origins reach back to 1600, most of the garden you see today dates to the 19th century, with an extensive reconstruction after 1949. The various artisans, designers, and architects involved in all these reconstructions took ideas from older gardens and combined them. The result is undeniably beautiful, and many will tell you that in Liu Yuan the Suzhou garden has reached a kind of perfection. 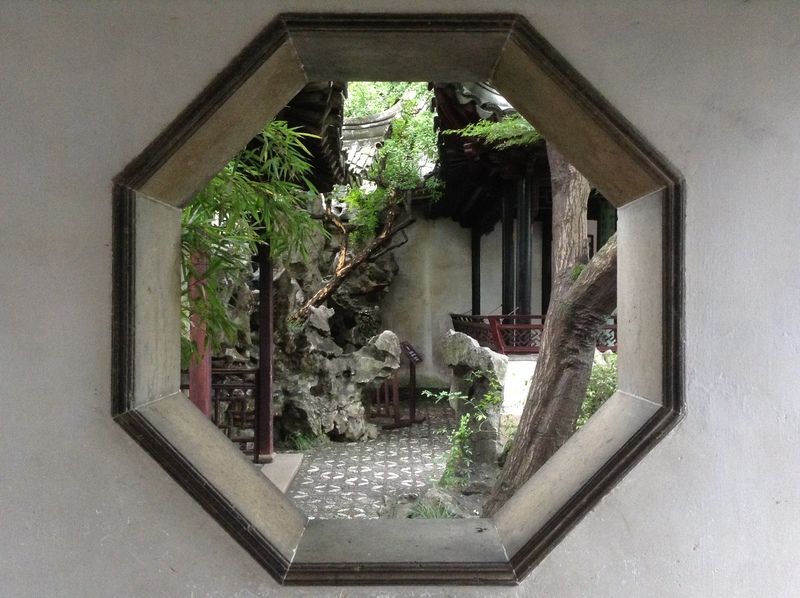 The ponds, the lotus, the bridges, the Taihu rocks, the latticed windows, the stone mosaics in the pavement, the pavilions, the windows framing the scene beyond as if it were a painting, the round doors, the bonsai garden, the bamboo and willows and banana trees—in all these familiar features of the Suzhou classical garden, Liu Yuan excels. Not too big, not too old, not too many rocks, not too much lotus . . . Liu Yuan wins the Goldilocks prize for everything being “just right.” I began my chapter about Wang Shi Yuan, the Master of the Nets garden, by writing, “If you visit only one garden, visit this one.” And yet, an argument can be made that if you visit only one Suzhou garden, it should be Liu Yuan, where you can find the best features of all the gardens fused into one harmonious whole. This perfection has made Liu Yuan a popular stop for the tourist buses, so you can expect to have lots of company when you visit, even mid-week. On the other hand, the popularity of the garden has prompted the management to hire people to dress up in traditional costumes and stroll through the garden as its owners might have done in ancient times, while others play traditional music or perform snippets of Kunqu opera. Some visitors will be charmed by these additions, while others may be put off and feel that they give the place a sort of Disneyland atmosphere. Personally, I always enjoy Liu Yuan. Each time I visit I am struck by some spot of beauty I had missed previously, or had somehow forgotten. But when I try to recall Liu Yuan, nothing vivid comes to mind. If you say “Humble Administrator’s Garden,” I see the lotus ponds. If you say “Lion’s Grove,” I see that labyrinth of Taihu rock. If you say “Master of the Nets,” I see its central pond. Perhaps it is the imperfections of those other gardens that make them distinctive and memorable, and Liu Yuan’s lack of imperfections that gives me the feeling that it has no personality. Go and have a look, and let me know what you think. Take subway Line 1 to Tong Jing Bei Lu. Leave the subway station via Exit 3, turn right (north), walk about 50 meters, and take Bus 317, 400, or 5. Get off at the second stop, just before the intersection with Feng Qiao Lu. At the intersection, turn left. You will see the yellow walls of Xi Yuan on your right, on the north side of Feng Qiao Lu. Follow the directions given above, until you get off the bus. Walk north to the intersection with Feng Qiao Lu. Continue straight (north), and then turn right at the next intersection onto Liu Yuan Lu. Walk another 200 meters to the garden entrance, on the north side of the road. Take Bus 933 to the Leqiao subway stop on Line 1, or take Bus 游1 to Guan Qian Jie, or walk back the way you came and take Bus #317, #400, or #5 south on Tong Jing Bei Lu two stops to Gan Jiang Xi Lu and Line 1 of the subway.